Newtons Labs is formulated towards those who suffer with oily skin and/or breakouts. While I dont have oily skin I am prone to the odd breakout. However since December its been really hard to get my skin back to normal and I almost have a new breakout every second day so I decided why not give this range a try in hopes it could calm my skin down. Starting with the Clear Pore Facial Wash*, if I were to rank these products in order of favourites this would be at the bottom, not because its a bad product but just because I'm not a huge lover of facial washes as they tend to leave my skin feeling quite dry. However I did use it every other day before applying any makeup just to make sure my skin was clear of any missed makeup from the day before. The Exfoliating Daily Wash* is amazing! I'd say I've about 1/3 of the product left and I just absolutely love it. I feel like this was a huge factor in keeping any breakouts at bay, I basically used this everyday religiously. I even started pairing it with the new Real Techniques Miracle Cleansing Sponge to really help my skin get a good exfoliating! Both these products work a dream together and I honestly cannot get enough of them. The Spot Zapping Gel* was a great little tool to pop in your bag for on the go although I did quite like using it at night time. This reduced the size of spots, reduced redness and took away any inflamation around the area. This is a life saver! If I would wake up with a spot I would pop a little of this on and within 3 hours the redness would be gone and the spot would be half the size. Remember I said I had to upload a different photo setup because I forgot to add in a product, yep this is it! The Newtons Labs Nose Pore Strips* I want to scream about at the top of the rooftops. So I've tried nose strips before and the few I have tried have been pretty rubbish, and if they did work it was barely a result so I was so skeptical about these but of course that didn't stop me trying them. OH MY GOD is literally all I can say about these. You get 6 strips in a box and I have 1 left because I was trying to keep it and I've already ordered another two boxes of these in a sneaky little Superdrug order thats on it's way. These strips are absolutely amazing, you know those videos on youtube of people using pore strips, the ones that are vile but also strangely addicting to watch, thats how good these strips are. I suffer with blackheads on my nose and these strips basically have my nose blackhead free! They hurt like hell when pulling it off but boy do they get everything out of your skin! The whole range has a very minty scent to it which almost leaves your skin feeling a bit of a tingle after using them. The products contain ingredients such as Tea-tree, Salicylic Acid, Charcoal, Witch Hazel and all those other good things that are great for breakouts. 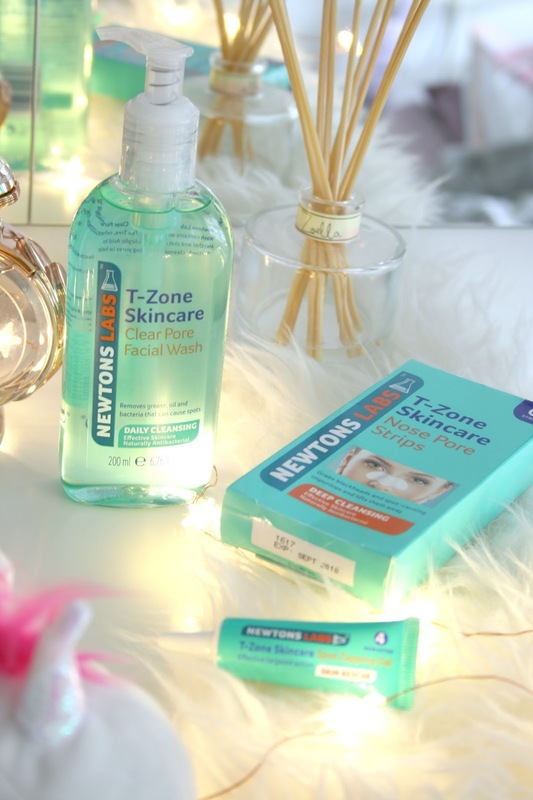 Newtons Labs have a whole range of products in the T-Zone range even going as far as cleansing wipes which I think sounds great! You can find the range in selected Superdrug stores, B&M, Home Bargains and more! Ranging from £4 I highly recommend this range to anyone especially those who may suffer with the odd breakout. The pore strips I'd recommend to anyone no matter what their skin type, I'm officially hooked on these bad boys and I can see myself using them for a very long time! They have some quality products and have made ensure that the products have minimal side effects on the skin. I have tried them many time and have no complain.